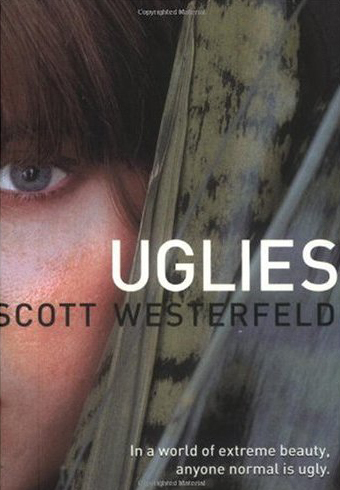 Sweet Sixteen has an all-new meaning in this futuristic society, where children are born “ugly” (that is to say, normal) and on their sixteenth birthday they get a life-changing operation that makes them gorgeous. “New pretties,” as they are now called, spend their days having parties and shooting fireworks and having a good time. Tally can’t wait until she “turns Pretty,” but just days before her sixteenth birthday, her best friend runs away to a place called “Smoke.” City authorities have been searching for the Smoke for a long time, and now they give Tally an ultimatum — find her friend and betray the Smoke, or never turn Pretty at all! There is no profanity in this book, but there is some name-calling. In fact, derogatory name-calling is standard among the youth of this society. It is not necessarily offensive to the reader, but children might latch onto it. While there is some kissing in this book, it is very tame (e.g. “They kissed.”). There is a fire, and scenes where people are fighting. Violence as an action is generally minimal, with the reader usually being shown only the after-effects (e.g. bruises). The writing didn’t really make an impression on me one way or another. The author tells you just enough to provide some sort of picture, but does not really “paint” a scene. The flow of action is steady, but not terribly gripping. For the first two-thirds of this book, I was rather apathetic to the plot and the characters. I didn’t feel terribly engaged, although the premise was interesting. I kept reading mostly because I didn’t have anything better to read. The last third of the book picked up pace, and I was sufficiently interested by the end that I will probably read the sequel. All-in-all, a decent book, but probably a one-time read. I think this book is best-suited for girls aged middle-school to high-school. Younger children will probably find it boring; adults might find it of passing interest. Boys will probably not identify with the story well.